As a runner even the mere suggestion that any other exercise is worthy of an hour of my time would probably cause me to stick my nose in the air and feel smug. Obviously the "suggester" just doesn't get it. They have never experienced the true high that comes from a really good run, or the jealousy that pulses in my legs when I drive past a runner gracefully gliding up a hill, even if I ran just finished my own run a few hours before. It's not that I haven't tried other workouts. I've been to boot camp classes. I've tried pilates and kickboxing. I've taken and enjoyed yoga, but when I say "enjoyed" really I mean that I liked the 2 minutes at the end where I enjoyed lying on the mat feeling like I accomplished something. It was like eating my vegetables or paying my taxes. It wasn't the class I enjoyed, but the feeling afterward. I have trouble with downward dog, whether that's because of my super-tight runner's hamstrings or just because I'm totally uncoordinated, I'm not sure. When I take yoga classes and suddenly discover that the rest pose is downward dog, I die a little on the inside. I once ran out of a yoga class after realizing that I couldn't do three out of the first four poses and had the male instructor follow me into the ladies locker room to drag me back. I survived, but I didn't exactly enjoy it. 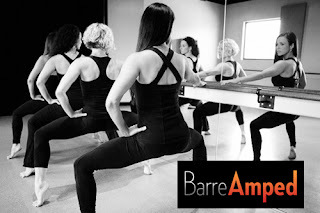 So needless to say, when I heard about BarreAmped I figured I would probably get something out of it, but I assumed I would take my one free class and then find my way back onto the comfort of my treadmill or elliptical by the time my next workout came around. If I'm going to spend an hour working out I want to get as much as possible out of it, and for me the most efficient way to do that is usually through straight cardio. When we walked into the room the instructor told us to pick up some 1, 2, or 3 lb. weights. Smugly I thought this class is going to be cake. If I lift (which is rare, I admit) I use 8 or 10 lb. weights, so the idea of using 3's seemed ridiculous. A minute and a half later I had already switched to 1's. My arms were burning! With stick straight arms we did tiny pulses in sets of 8 to target our biceps, triceps, backs and shoulders from every different angle. We didn't put our arms down, we didn't have big sweeping motions that let us use momentum to do the work--everything was tiny and precise and controlled. From there we went to the barre. By the time we did squats, leg lifts, and "seat work," the term "up an inch and hold, up an inch and hold" was burned into my brain. My legs were shaking. Seriously shaking. I felt like a weirdo who had suddenly lost all control of my limbs. (According to our instructor this is totally normal and shows that you're really working all of the tiny little muscles in your body that we don't usually use. I think she was just being nice.) I do squats and lunges on my own and I have never had that kind of a reaction from my body. It was crazy. We then went onto the mat and did ab work and finished with push ups and planks before some stretching. Every exercise was completely focused on form. There was no getting lazy. There was no slacking off. By the end of each movement my body was burning, but in the best way possible. Even though I was incredibly sore for 2 days after the class, I am now a total Barre Amped addict. It will never replace running for me, but it has finally made me look forward to strength training. I feel myself getting stronger, and I'm sure that if I stopped eating massive amounts of Whoopie Pies, I would see my muscles become more toned. It's an hour mental break in my day that I can feel amazing about afterward. The craziest part is, if I hadn't stepped out of my comfort zone and tried the class, I never would have known what I was missing! What are you willing to try today? I am a 32 year old runner, writer, and sales rep who lives outside of Philadelphia with my husband Mike and our dog Clyde. I'm also a new mom to a beautiful baby girl.